TORONTO -- Lourdes Gurriel Jr. drove in a pair of late runs and the Toronto Blue Jays bounced back from a rough start to beat the Tampa Bay Rays 3-1 on Saturday. But with Snell out of the game in the seventh inning, the Blue Jays (5-10) pounced on reliever Chaz Roe. Justin Smoak started the rally with a single and a Randal Grichuk double put runners on second and third to set the table for Gurriel's two-run double. Teoscar Hernandez padded Toronto's lead with an RBI single in the bottom of the eighth. Closer Ken Giles worked around a one-out base hit in the ninth for his fourth save. 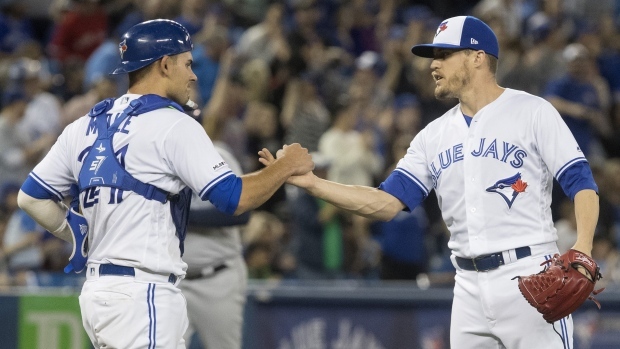 Buchholz, who spent 10 seasons in the AL East with the Boston Red Sox, signed a one-year deal with Toronto during spring training. He'd been rehabbing from an elbow flexor strain suffered last season with the Arizona Diamondbacks. The Blue Jays have gone hitless through the first five innings in five of their 15 games this season. That ominous trend began Day 1 with Toronto's home opener, when Detroit's Jordan Zimmermann took a perfect game into the seventh before it was broken up. Blue Jays manager Charlie Montoyo used a video review challenge on a double play in the fourth when Hernandez was called out at first. The call was overturned. Montoyo had elected not to use a challenge on a potential game-altering play during Friday night's loss and said before Saturday's game he should have used it in that situation. NOTES: Infielder Richard Urena was optioned to triple-A Buffalo before the game to make room for Buchholz on Toronto's roster. ... Toronto shortstop Freddy Galvis had a seven-game hitting streak snapped. ... Attendance was 20,771. ... The Blue Jays cap the three-game series Sunday. Marcus Stroman will start for Toronto. He's 5-5 with a 4.58 ERA in 13 career starts versus Tampa Bay.